Dust off your slow-cooker this week! Stir up delicious Crock-Pot lentil soup, full of nutritious vegetables and sweet potato chunks. Add some crusty bread and you'll have a tasty fall meal that will keep you warm as temperatures dip. Also this week, experiment with squash! 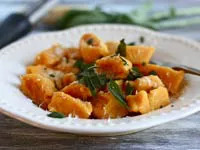 Try a bright-orange kabocha squash in a spicy Thai curry with chicken and vegetables, and then make your own Italian takeout with butternut-squash gnocchi. You'll never believe how easy it is! Gnocchi is easily made at home! I love mine tossed with butter and Parmesan cheese for the ultimate comfort meal. 1. Preheat oven to 400 degrees. Peel and slice squash and roast on a lined baking sheet for 30 to 40 minutes until very tender. Remove and let cool. 2. Once cool, puree squash in a blender or food processor, then transfer to a large bowl and add flour, egg, and salt. Mix until a dough forms, and then knead on a heavily floured surface until smooth. 3. Bring a large pot of water with a pinch of salt to a boil. 4. Divide gnocchi dough in half and roll each half into a large, thin rope. Cut the rope into 1-inch slices. Once water is boiling, drop gnocchi in and boil until they float. Drain the gnocchi and serve with either melted butter and Parmesan cheese or a creamy alfredo sauce. Creamy, spicy, and comforting, this Thai classic is sure to be a new favorite in your house. 1. Preheat oven to 400 degrees. Drizzle olive oil on a foil-lined sheet tray. Slice kabocha squash, remove seeds, and place cut-side down on the sheet tray. Roast squash halves for about 30 minutes until tender. Remove and let cool completely. 2. In a large pot or deep pan, heat canola oil over medium-high heat. Add curry paste and mash into hot oil so all the paste gets incorporated. Slowly drizzle in coconut milk, whisking continuously until all milk has been added and no curry clumps remain. 3. Add water, torn kaffir lime leaves, Thai basil, fish sauce, brown sugar, and Thai red chilies, and bring to a simmer. Add chicken, red bell peppers, and green bean halves, and continue simmering sauce for about 15 minutes until vegetables are just cooked but not mushy. 4. Peel or slice kabocha squash away from rind. Chop into large chunks and add to curry sauce. 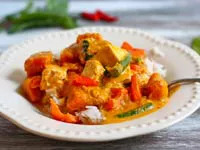 Serve curry over jasmine rice (don't eat the chilies!). Throw all the ingredients in the Crock-Pot before you go to bed and wake up to the smell of homemade vegetable soup permeating your house! 1. Combine all ingredients in a slow-cooker. Turn heat on low and cook for 10 hours, adding a little more broth at the end if soup seems too thick.